Ms. Foster has over 21 years of U.S. and international experience in the water and wastewater sector, with public, federal, and industrial clients. Her experience spans the breadth from business development and enterprise management to project management. She has delivered projects in both traditional and collaborative delivery methods, including CMAR, design-build, and progressive design-build for municipal and federal clients. Chitra’s specialties include collaborative delivery project development, CMAR, design-build, and progressive design-build project management, design-build risk assessment and contract negotiations, and design-build legislative development. 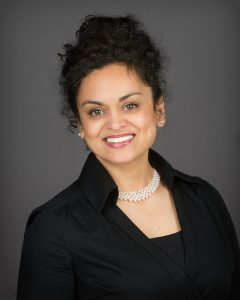 Chitra received a BA in mathematics from Coe College, a BS in civil engineering from the University of Iowa, and a MS in environmental science and engineering from UNC. She is a certified professional engineer in North Carolina, and a certified design-build professional. In addition to being Carollo’s alternate on the WDBC Board of Directors, she is also a member of the American Water Works Association.